Last week's Chicken Enchilada Dip was featured at Full Plate Thursday. Woo-hoo! all three are getting knocked out in one fell swoop. Today, like seriously right now just for you at 8:11am on a Thursday, I am making Kohl Rabi & Sugar Snap Pea Risotto - just as soon as I get in from picking the sugar snaps out of the garden. Okay, so started making the risotto and had a mild panic thinking that I might be out of arborio rice. Rice was found. Crisis averted. If your peeps insist on having meat with every meal, you could always throw in some cooked and shredded chicken to this and it would be very tasty. Boil 4c. water in a saucepan, drop in stock. Stir, cover, and keep warm. Go three times around the pan with the oil and get the pan heated. Drop in the butter, kohl rabi, and onions. Cook for about 5 minutes. 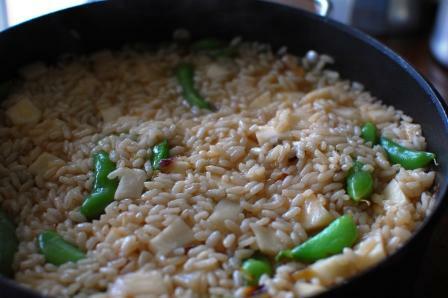 Next, put the rice in the onion mixture and cook until rice is translucent (about a minute). Pour in the wine and cook until it has been absorbed. Pour in the stock one ladle full at a time waiting each time for it to be absorbed by the rice. Once the stock is gone, if your rice is still not tender enough for you, pour in a little water, and by little, I mean like 1/2c.-ish at a time until it is where you want it to be. Just before it is at the consistency that you like, stir in the peas, cut off the heat, and put a lid on the pan for 5 minutes. Grate Parmesan over the top to serve. The Knorr Homestyle stock was so convenient! I have reveled in homemade stock for years but the downside to my stock is that I freeze it (because I am terrified of my pressure cooker). Which means when I want to use the frozen stock, I have to have some foresight to let it thaw - no impromptu risotto for breakfast. I looked for the MSG in it and couldn't find it. That's because it isn't there. Many of the stocks available use MSG as a flavor enhancer but not Knorr Homestyle. What it comes down to is taste, and this tastes good. *I was sent a package of Knorr Homestyle Stock by Smiley360 to use and review. All opinions are my own. Oh Ms. Amanda, sugar snaps are so stinkin' easy to grow just stick a couple of dried peas in a pot and let it go. The Knorr stock really is good and great in a pinch. I think I need to keep some Knorr stock on hand. I'm notorious for forgetting to thaw mine! I am so happy that Red Plate motivated you to make this awesome dish. This looks delicious with those fresh peas from the garden, oh my I can almost taste it. Hope you have a great week end and thank you so much for sharing with Full Plate Thursday.